Burning videos/photos to DVD/Blu-ray disc/ISO file/DVD Folder. Support a large number of input and output formats for Blu-ray burning. Real-time preview before Blu-ray burning. Super fast burning speed and high-quality output. If you are looking for the Blu-ray disc burner that you can use on your Mac then you have definitely come at the right place. Though a large number of such software are available, but many of them have no compatibility with Mac. If you are a Mac user and are looking for an efficient Blu-ray burning software then you have come at the right place. Here, we are enlisting the best Blu-ray burners that you can rely on. What's more, we also recommended the best Blu-ray disc converter for Windows users. Here we list top 6 Blu-ray disc burning software for Mac system, which allow you to convert videos to Blu-ray disc easily and clearly, so that you can play them on TV or other playable devices. 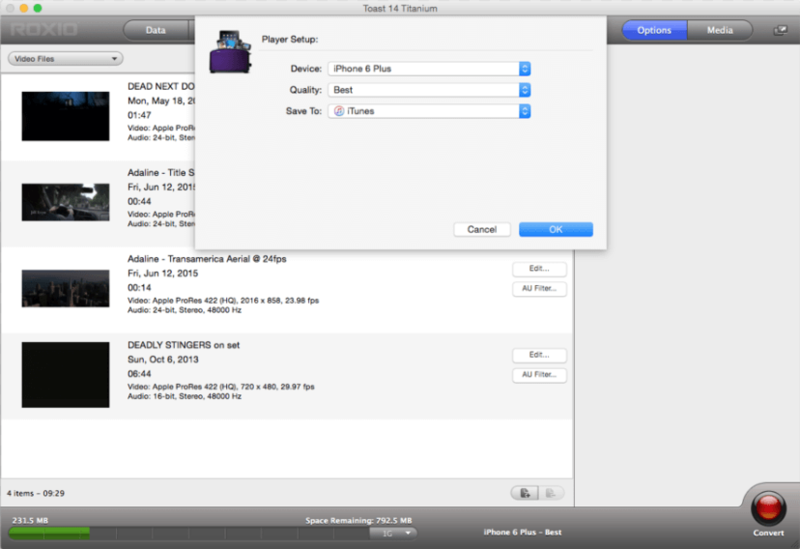 Blu-ray creator is the perfect software that you can use to burn any video or audio files to Blu-ray discs on your Mac. The user-friendly interface of this software is much easy to use that even the new users will be able to use it without any problem. 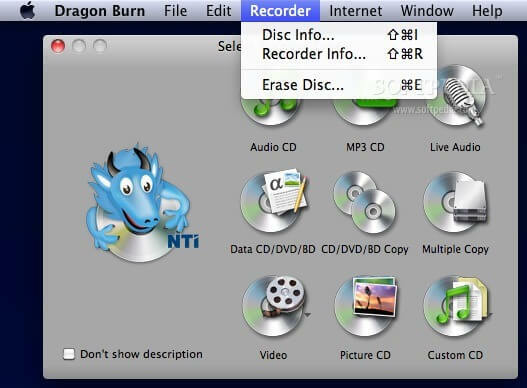 It is not only the Blu-ray burning that this software supports, but it also enables you to edit the video before burning them to CD. You can add title, watermarks and special effects to the videos before burning them. It is available for $39.99. Is able to convert all the major video formats. Supports a great range of Blu-ray output formats which include BD-RE, BD-50, BD-25, BD-R and more. Along with burning the videos to Blu-ray disc, it also saves their copy to the hard drive. The entire conversion process occurs in transparency, you will be able to see the real statistics. Enable you to burn the video to Blu-ray disc or save them into a Blu-ray folder. Looking for an easy way to burn videos to Blu-ray? Then you must go for choosing the Express Burn. With a good support to all the video formats, BD formats and a simple conversion procedure, Express Burn enables you to burn whichever format and video you want to burn. The simple Blu-ray burning process enables you to burn the videos at fast speed, ensuring good quality at same time. It is available for $49.99. Express Burn supports all the well-known video formats. You can choose among the standard or wide screen formats. Provides you the option to edit videos before you burn them to Blu-ray disc. Simple but decent interface that you will love to use. Blu-ray disc burning without affecting the quality of the video. Though Roxio Toast was there to meet all your video conversion related needs, but the Blu-ray burning has only been enabled in Roxio Toast 14 Pro. Like above given software, the process of Blu-ray burning is also simple with this software. You just need to load the videos, select various customization options and click on the burn button. You will be thinking that how this software is better than others, so, let us tell you some features of this software. Roxio Toast 14 Pro will cost you $150. A large of options for selecting output formats. Can burn almost all the video formats to Blu-ray disc efficiently. Fast and quick burning which is not affected by the size. It provides you a large number of editing options for your videos. It is best for all- new as well as experienced users. It is one of the best Blu-ray burning software that allows you to burn the videos directly to the Blu-ray disc or save them in your PC as Blu-ray folder. It lets you customize the video and preview it before burning to the Blue-ray disc. Here are some of its features. Clear and concise user interface that enhances the user experience. Undoubtedly, supports all the major audio and video formats. It is a powerful application that enables you to burn different video formats to Blu-ray disc. Along with creating the Blu-ray copy of the video files, it also enables you to do the basic editing and customizing various output options before clicking on the “burn”. Its user-friendly interface lets the users to create the Blu-ray copies of the videos. Different tools and configurations are available. Provide support for various video and audio formats. If you are looking for a program with high performance and flexible burning then Blu-ray creator for Mac is the best option. The built-in editing tools feature a highly intuitive interface for video creation and Blu-ray burning. Its customization options let you have plenty of control on the videos to be burned. It is available at $39. 95. Burn videos or photos in any format to Blu-ray/BDMV/DVD/ISO file. Additional tools like burning Data Disc, ISO to DVD, creating photo slideshow, editing videos, copying DVD, converting DVD to video, one-click to burning DVD/Blu-ray disc, etc. 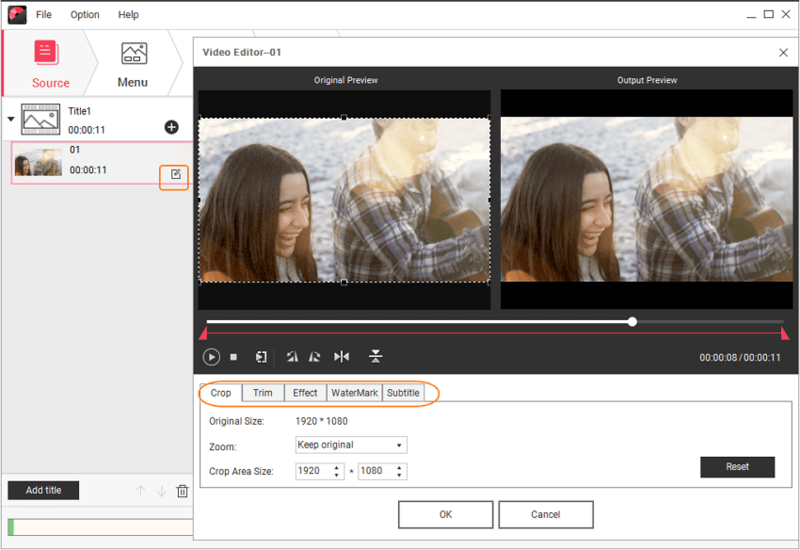 Built-in video editor with functions of Trim, Crop, Rotate, Subtitle, Watermark, Effects, and others. Create Blu-ray disc menu with 100+ DVD menu templates and customization such as changing background picture/music, adding text, editing thumbnail, etc. Burn videos to Blu-ray disc with real-time preview, super fast burning speed, and high-quality output. Supported OS: Mac OS X 10.14, 10.13, 10.12, 10.11, 10.10, 10.9, 10.8, 10.7, 10.6, Windows 10/8/7/XP/Vista. Download, install and open Wondershare Blu-ray creator on your PC, then choose Create a Blu-ray(BDMV) Disc option to begin with. To add files to the program, click the " + " icon on the interface and you can browse and add videos or photos present on your PC. 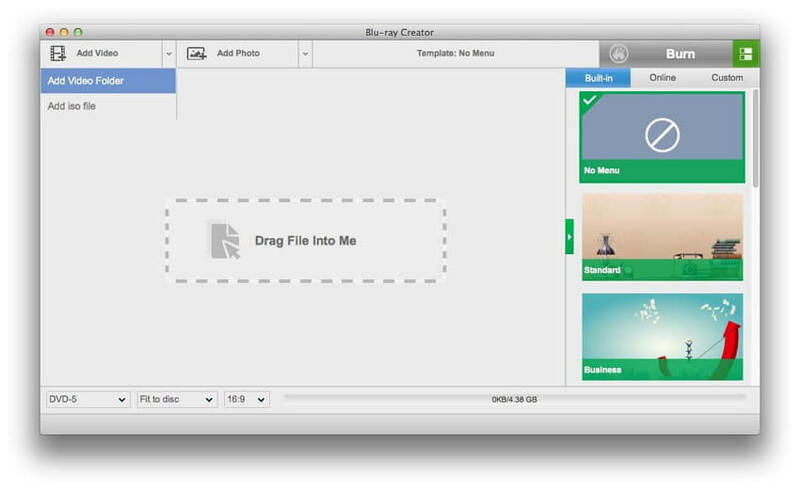 Simply drag and drop to import files is also supported. You can see all added files on the letf pane as thumbnail. 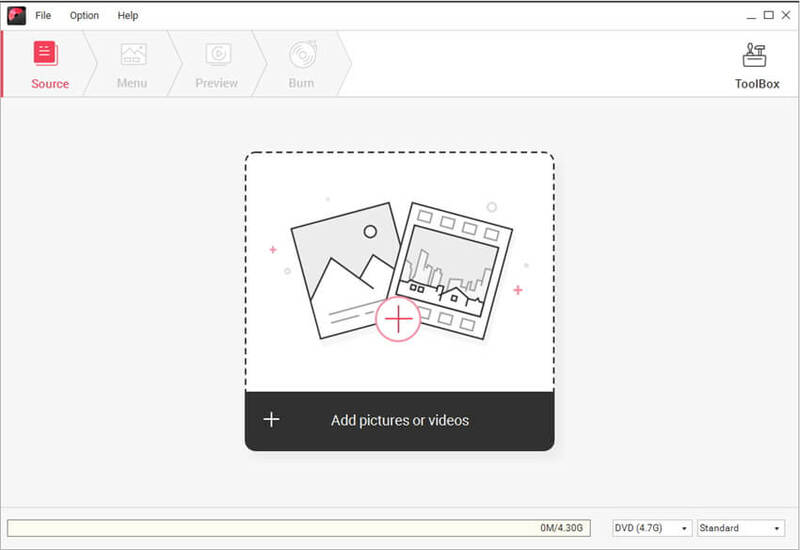 Click the pencil-like icon on the thumbnail to open the Video Editor window, and you can edit videos here by cropping, trimming, rotating, applying effects, adding watermarks, and others. Feel free to skip this step if you want to keep your video original. Click the Menu tab and you can see 100+ free templates for your Blu-ray disc menu on the right panel. Choose one you like and double-click to apply. Hit the icons upon the active window and you'll be allowed to make further customization such as changing background images, adding music, adjusting aspect ratio, etc. You're allowed to check your creation under the Preview tab, go back and make changes if something dissatisfied you. Next, move to the Burn tab and choose Burn to disc option, select Burning Settings like Disc Label, Burner, TV Standard and others. Finally, click the Burn button to start converting videos to Blu-ray disc on Windows quickly and easily. 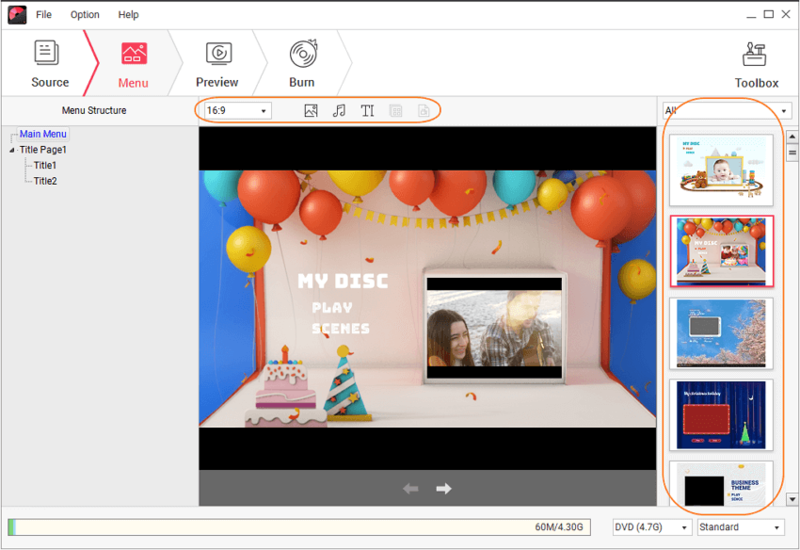 With Wondershare DVD Creator, you can also burn videos and photos to DVD on Mac system with the same high-quality output of Blu-ray disc.